Five people have been arrested in China’s northern Hebei province after being caught digging a tunnel into a pagoda to steal antiques. Three others escaped. 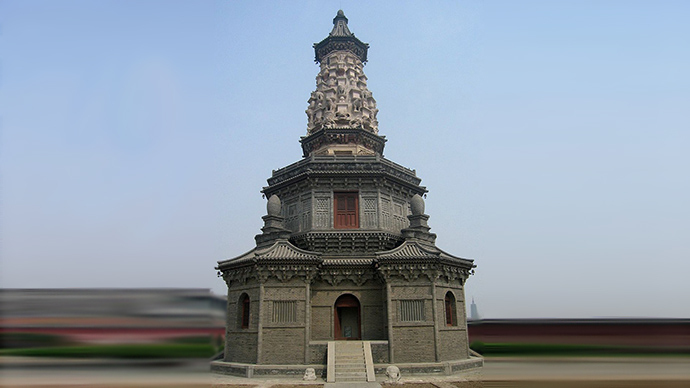 According to police, the group rented a restaurant close by in order to use as cover for burrowing into the Guanghui Temple in Zhengding on March 2. But local police suspected something was amiss when the restaurant didn’t open on time. According to the Global Times, the police received prior information that a crime was going to take place. When they entered the restaurant they uncovered a 7-meter-deep hole, connected to a tunnel more than 50 meters long. Police say the digging started all the way in December. The pagoda the thieves were breaking into is a treasured remnant from nearly 1,000 years ago, around the time of the Jin, or Jurchen Dynasty. It was put on China’s list of cultural relics in 1961. The temple is much older, dating back to about 618-907 AD.